Sales of new single-family houses in April 2016 were at a seasonally adjusted annual rate of 619,000. This is up 16.6 percent month-over-month and up 23.8 percent year-over-year. The median sales price of new houses sold in April 2016 was $321,100; the average sales price was $379,800. 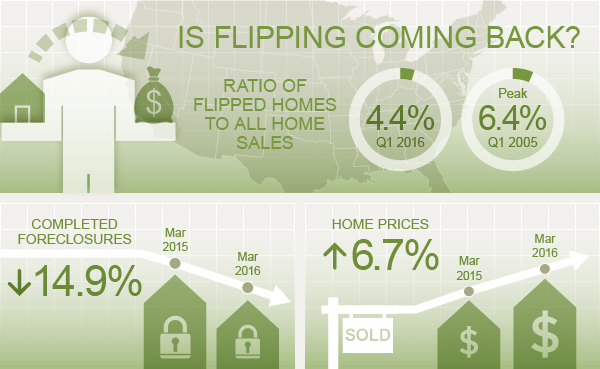 In March 2016, the ratio of flipped homes to all home sales was 4.4 percent. Completed foreclosures were down 14.9 percent year-over-year. Home prices were up 6.7 percent year-over-year. The total foreclosure pre-sale inventory rate is 1.17 percent, 5.87 percent lower than March 2016 and 27.76 percent lower than April 2015. The total foreclosure starts in April were 58,700, down 19.37 percent month-over-month and 16.62 percent year-over-year. The number of properties 30 or more days past due but not in foreclosure totaled 2,146,000, up 84,000 month-over-month but down 179,000 year-over-year. First-time homebuyers accounted for 38.9 percent of home purchases in April 2016, up from 38.1 percent in March 2016 and 37.2 percent in April 2015. Current homeowners accounted for 45.7 percent of home purchases in April, and investors had a 15.4 percent share. Move-in ready real estate owned properties received an average of 2.4 offers in April, and non-distressed properties received an average of 2.2 offers during the month. What does inflation have to do with the rising cost of housing? Will the Fed raise rates in June or not? Could negative mortgage rates really happen?